We already shared a thing or two on this topic in our Pascal GPU reviews. Initially Nvidia would support 2-way SLI but allow 3 and 4-way SLI mode only with a 'enthusiast driver key'. As it seems though, Nvidia is abandoning that idea as well and sticking towards 2-way SLI only. Quite honestly, I tend to agree on the decision. "With the GeForce 10-series we’re investing heavily in 2-way SLI with our new High Bandwidth bridge (which doubles the SLI bandwidth for faster, smoother gaming at ultra-high resolutions and refresh rates) and NVIDIA Game Ready Driver SLI profiles. To ensure the best possible gaming experience on our GeForce 10-series GPUs, we’re focusing our efforts on 2-way SLI only and will continue to include 2-way SLI profiles in our Game Ready Drivers. DX12 and NVIDIA VR Works SLI technology also allows developers to directly implement and control multi-GPU support within their games. If a developer chooses to use these technologies then their game will not need SLI profiles. Some developers may also decide to support more than 2 GPUs in their games. We continue to work with all developers creating games and VR applications that take advantage of 2 or more GPUs to make sure they’ll work great on GeForce 10-series GPUs. For our overclocking community, our Game Ready Drivers will also include SLI profiles for 3- and 4-way configurations for specific OC applications only, including Fire Strike, Unigine and Catzilla.,"
In short, it means only 2-way SLI will get Nvidias support. In the drivers there will remain SLI profiles for three and four way cards in combination with special applications for shattering some benchmark records like 3DMark Fire Strike, Unigine and Catzilla. Nvidia also promises to help businesses games and VR applications who can and would like handle more than two cards, but it seems it'll stop right there. PC Perspective got the statement after an unsuccessful attempt to get four GeForce GTX 1080 cards up and running. Only in LuxMark the website managed to set a score. While I am sure some of you might be disappointed, me personally not that much ... in my experiences anything passing two GPUs for gaming has been a struggle drivers and/or hardware wise (CPU bottlenecks and what not). Then again, some of you with three Ultra HD monitors and some serious plans might be saddened about this news. To be honest, this was exactly my interpretation when they told us 3 & 4 way SLI were not recommended, and would only be possible using some 'enthusiast key'. Some people appear to be surprised by this more explicit announcement, but we all saw this coming didn't we? Also, who actually used 3 and 4 way SLI specifically for benefits in gaming scenarios? I thought >2 card support was always dodgy to begin with... It was my interpretation that the market for >2 cards was the overclockers market, which will still be able to use it. Killing support for >2 cards in games, hence being able to focus more on support for 2 cards (hopefully), seems like the right decision to me. heh , seems they already got too much to handle with 2 cards let alone 3 or 4. SLI used to be so awesome when it was introduced , and look at it now. It became a joke! I've been an SLi user since 2005, and still run SLi today. It's a great technology, but it's potential has never been fully realized. 3 and 4 way support has been waning for a long time, and the new CPU's lack the PCIe lanes for a full x16 setup with 3 and 4 cards, so I get it. As I recall, we started seeing struggles with SLi when they introduced gpu based physics (physX), and later technologies like Gsync, and DSR. Getting that stuff to work together across 4 GPU's seemed to be more trouble than it was worth. I suppose scaling always was an issue. Does AMD still support three and four way Crossfire for their new hardware? It might be a good idea to fill a niche Nvidia has given up on. Even with the old implementation, I got great scaling in the battlefield games, with my 3 way 290x setup. Overwatch scales pretty well too. close to 100%. You can still do 3-4 way MGPU in MDA games that support it. The scaling in AFR is terrible though and newer games are using techniques that completely kill MGPU in AFR mode. I'd rather them kill it and inform people why then just let people buy it in half supported anti-scaling limbo like it has been. If two cards can produce the desired fps then i suppose no one would care that much about losing 3way & 4way sli. The 1080 has been shown to be able to hit those high numbers depending on resolution of course but in the mainstream 1080p/1440p then 1080's are more than enough. The problem is that three 1070's could beat two 1080's while being a cheaper alternative. So nVidia might be shooting itself in the foot but only for a small percentage of power users/enthusiasts. It's still to be seen whether someone can buy two cards that out perform a much high level card. Maybe in the near future i could get 8gb 1060Ti's sli'd to match a single 1080 for less cost. Only time will tell. 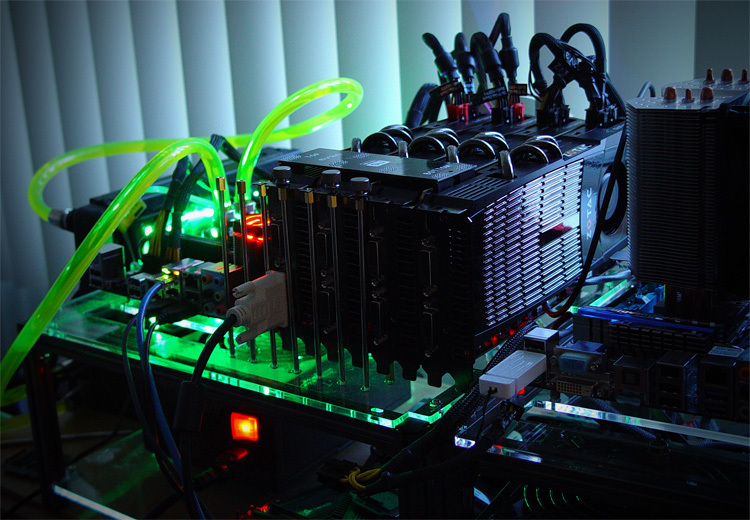 People with more than 2 video cards use their rig for cracking passwords or mining bitcoin. I'm sure they won't be affected. I believe the cards in the picture are gtx 480's. SLI started to become a big issue... with the advent of all the post processing effects that have appeared in games over the past 4-5 years. A lot of these post effects cause conflicts with SLI configurations, hence why we've seen a decline in SLI over the years. Now with DX12 shifting SLI more toward the developer, I bet we see it decline further. The only way I could see it making a big comeback if somehow a console adds a dual-GPU configuration. I really don't see that happening anytime soon if at all. I'm still planning to do 2-way SLI for the 1080... but honestly after that I might go back to 1 card if Nvidia really steps things up for the 1100 series. They gave up for a reason. Highly doubt AMD can do any better. I'm a long time SLI user. I've had nearly zero issues with either 3dfx or nvidia in sli. A few minor issues with ati, but they were fixed in a timely manner via driver updates. Overall, I find it an excellent experience that I wouldn't want to give up. Maybe I'm lucky, maybe it's pebkac, maybe whatever. In any case, I love me some sli.